The 28-year-old New York native is most widely known for his current role: the lead in Broadway’s most expensive, action-packed and contentious musical, Spider-man: Turn Off the Dark, which returned to the stage on May 12 after a nearly month-long shutdown. 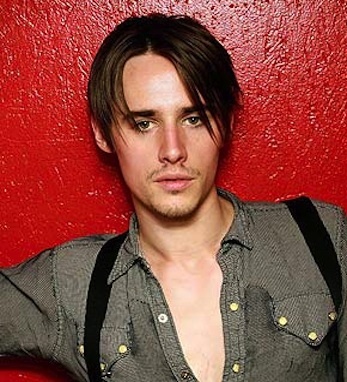 When he isn’t swinging on webs as Spidey or trying to woo Mary Jane as Peter Parker, Reeve Carney is the lead singer in the eponymous band, touring the U.S. with his fellow Carney band mates: his brother Zane, drummer John Epcar and bassist Aiden Moore. In 2008, director Julie Taymor saw the band performing at the Mercury Lounge in New York and was so impressed that she asked Carney to audition for the role of Ferdinand in her film adaptation of The Tempest. The following year, when casting began for her Spider-man collaboration with Bono and The Edge, Carney was one of the first people she asked to try out. After an intense audition process, Carney snagged the role. The band managed to stick together, though: the other four members of Carney appear onstage in the orchestra. The Carney brothers were, as they have put it, “bi-coastal” for many years, spending one half of the year in New York and the other in Los Angeles until Reeve was 10, when the family permanently relocated to L.A. Both have said that they are happy to be back in New York for the run of Spider-man. Though he is clearly thrilled to be playing Spider-man, Carney has also indicated that his heart lies with his band. In an interview with broadway.com, he called being on the road his “favorite place…I wouldn’t trade it for anything. The freedom you feel when you’re out there—there’s nothing like it.” The group’s first full album, Mr. Green Vol. 1, was released in 2010, following a 2006 live album, Live at Molly Malone’s. Carney is a grandnephew of beloved Irish-American actor Art Carney. Read Irish America’s interview with Reeve here.